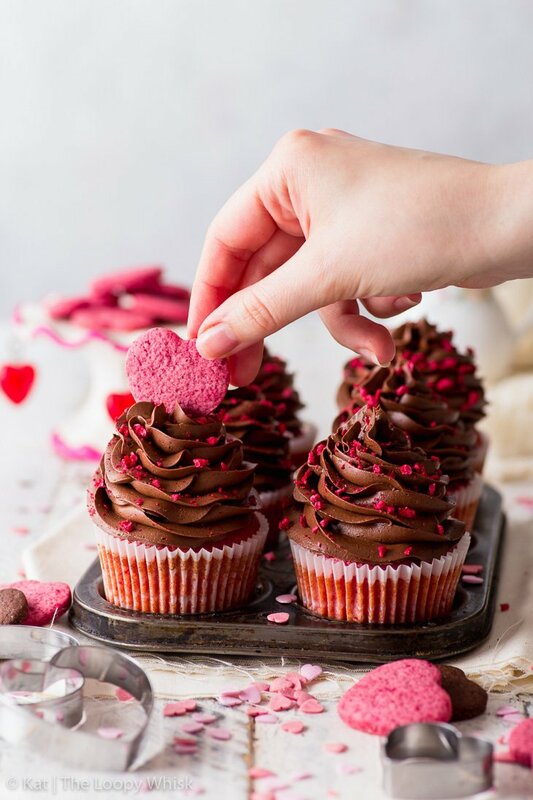 Beautiful, delicious and full of heart – these raspberry & chocolate Valentine’s cupcakes are the perfect way to share your love. 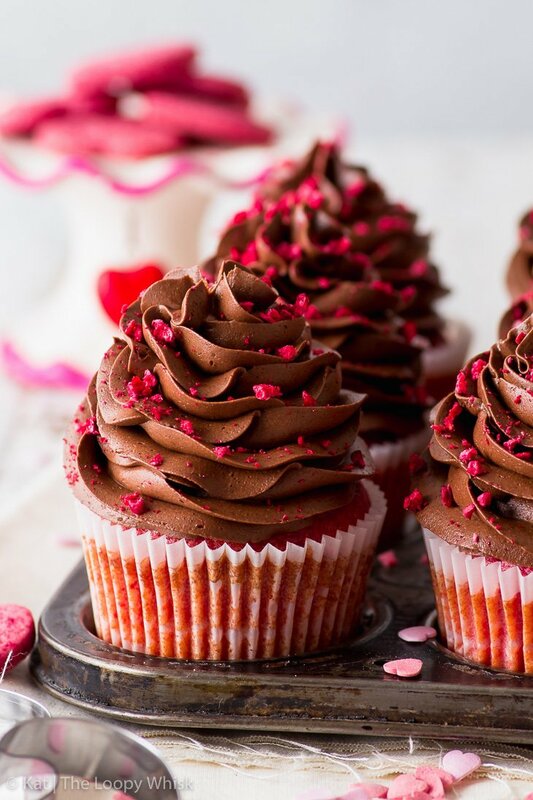 With moist raspberry cupcakes, a raspberry jam centre, and topped with a luxurious chocolate buttercream frosting. Plus, they’re easy to make! 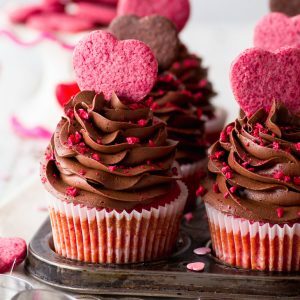 Are you a fan of Valentine’s Day? Feel free to say no – I know I’m pretty indifferent about the whole affair, myself. I’ve always thought that the spontaneous expression of love is so much more meaningful than a bouquet of roses on the 14th of February. 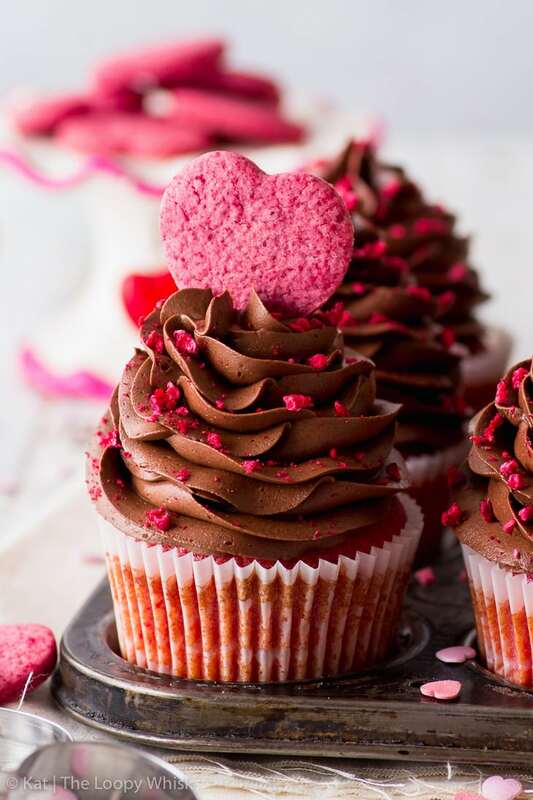 These raspberry & chocolate Valentine’s cupcakes combine two of the best flavours out there. The bittersweetness of chocolate and the refreshing tartness of raspberries – which perfectly complement each other. 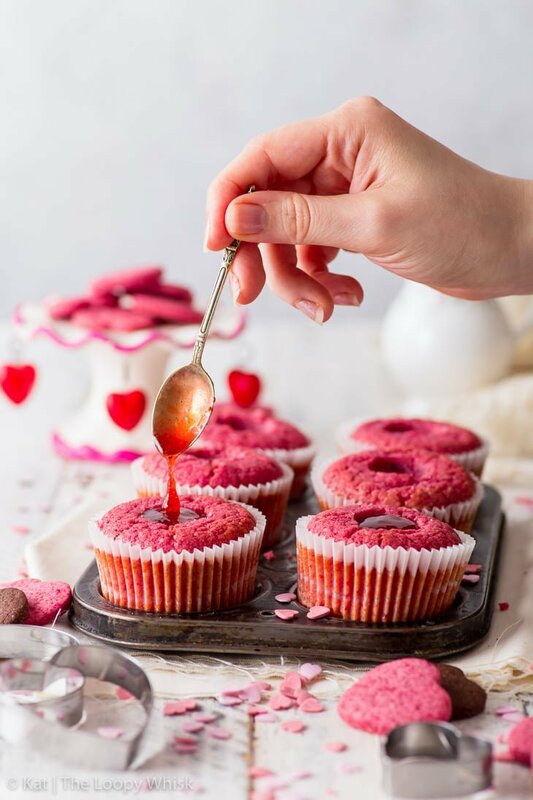 First, we’ve got the raspberry cupcakes themselves – flavoured (and coloured) with a raspberry reduction and some beetroot powder for an extra natural colour boost. 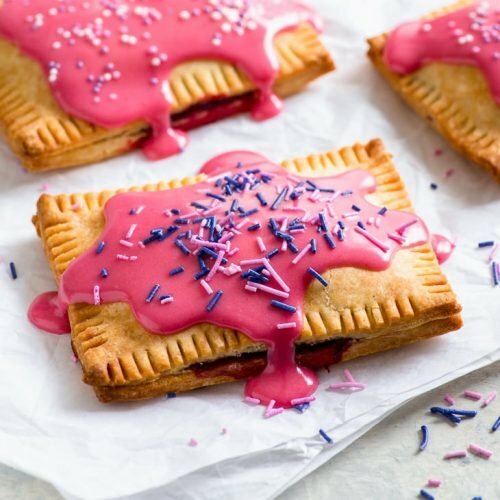 You can, of course, use a pink food colouring, but I’ve always preferred natural alternatives myself. 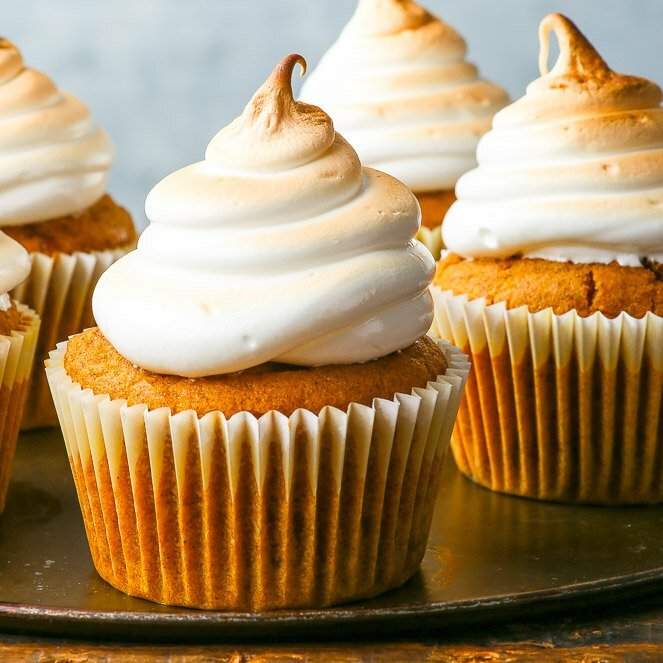 The cupcakes are moist, delicate and fluffy – just how we like them. The raspberry flavour comes through beautifully, especially in combination with the raspberry jam centre. 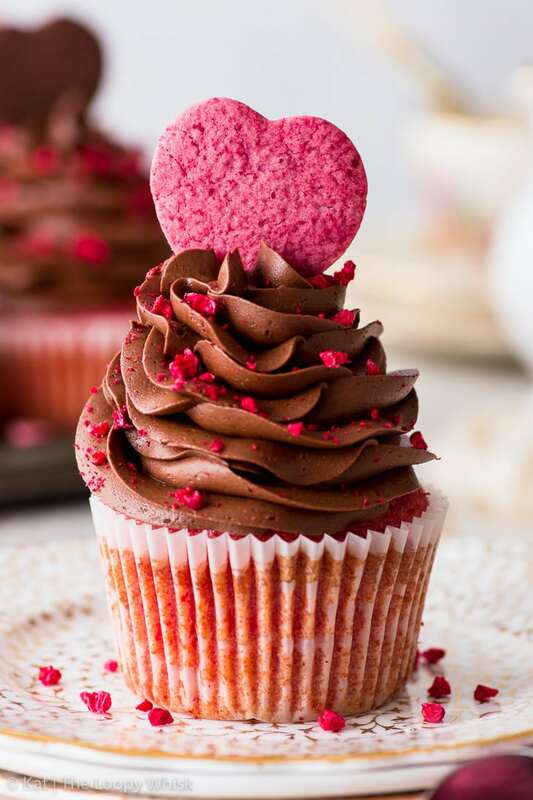 There’s something magical about biting into a gorgeous cupcake, only to discover it’s hiding a delicious secret – an oozing centre of raspberry (or chocolate) goodness. 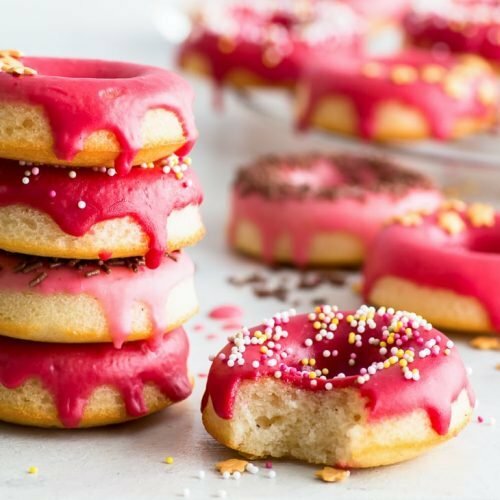 You can either use a raspberry jam, maybe spruced up with a squeeze of lemon juice to make it more refreshing, or the raspberry reduction with a spoonful of powdered sugar stirred into it. And then, to top it all off: the most decadent, luscious, luxurious chocolate buttercream frosting. 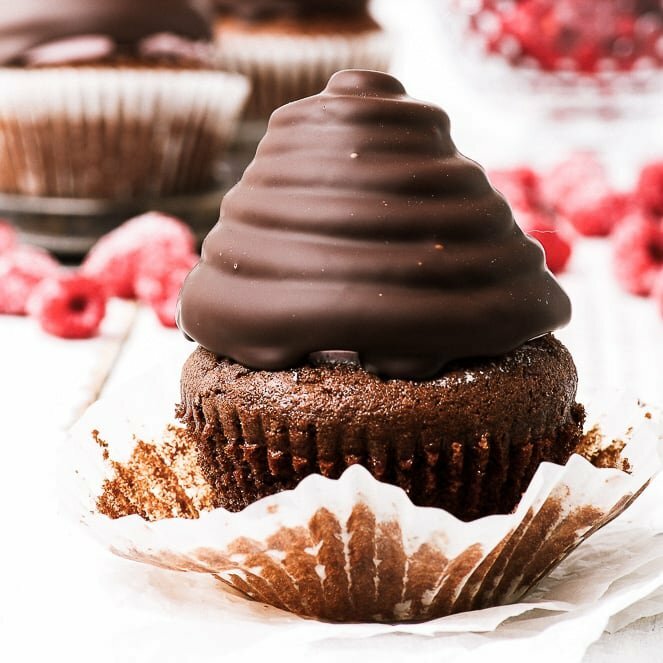 This is my go-to recipe that I use all the time – in my ultimate gluten free chocolate cake, in the triple chocolate cupcakes… and it’s PERFECT every single time. 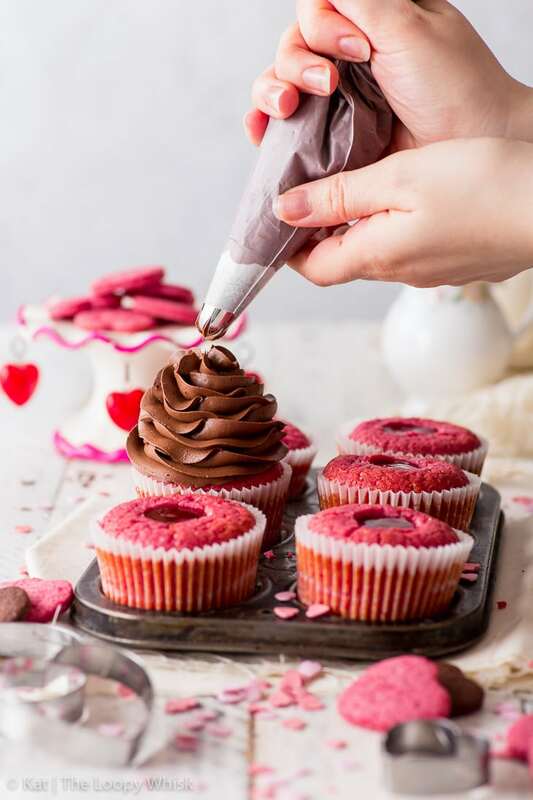 It also pipes beautifully – here, I’ve used the Wilton 2D piping nozzle, with creates a gorgeous swirl on top of the cupcake. Seriously, look how glossy and elegant and just plain beautiful it is!!! 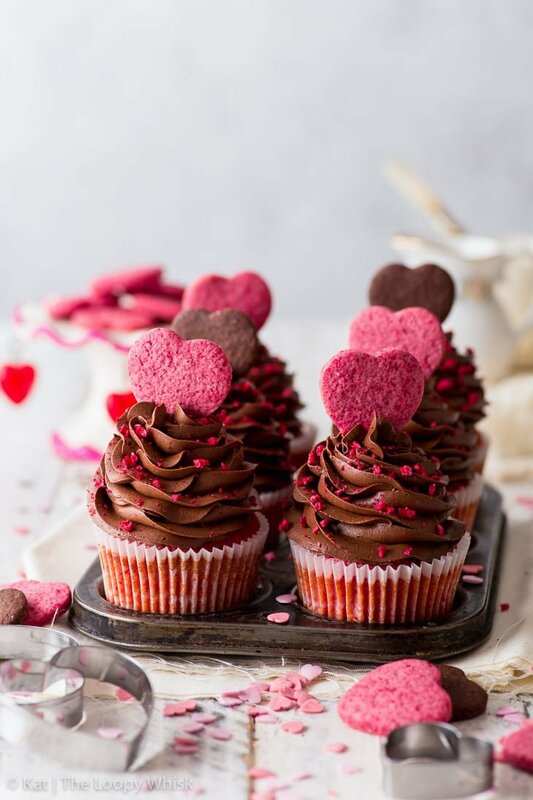 As a finishing touch, a sprinkling of crushed freeze-dried raspberries as a pretty pink dusting on top of the rich buttercream swirls, and a heart-shaped cookie – these are, after all, romantic Valentine’s Day cupcakes. Now, I’ve had some heart-shaped sugar cookies on hand. 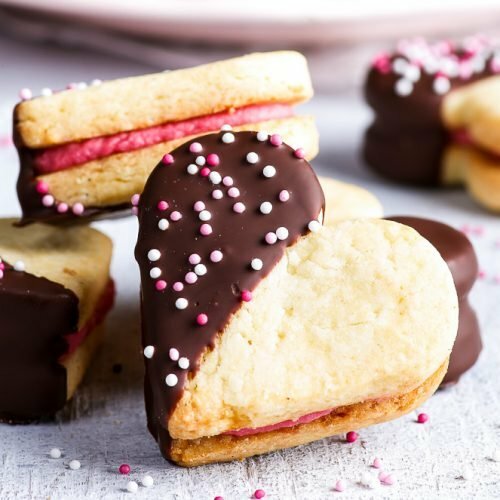 They are simple gluten free sugar cookies with either cocoa powder or raspberry reduction + beetroot powder added, rolled out, cut in the shape of a heart and baked. 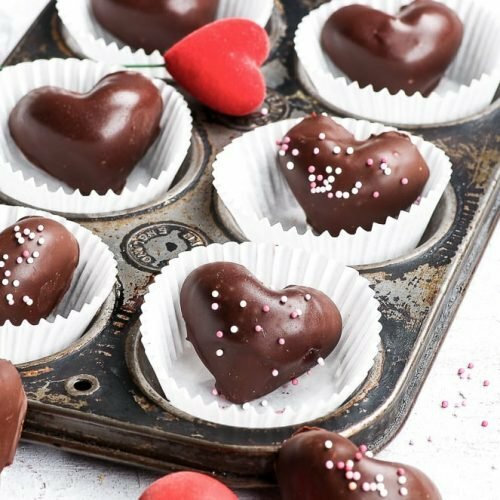 If you don’t feel like making these, for whatever reason, you can use heart-shaped chocolate decorations, or even pink-coloured marzipan cut out in the shape of a heart. Go crazy, and cutesy, and even a bit kitschy. Just… enjoy it and have fun. So here we are. 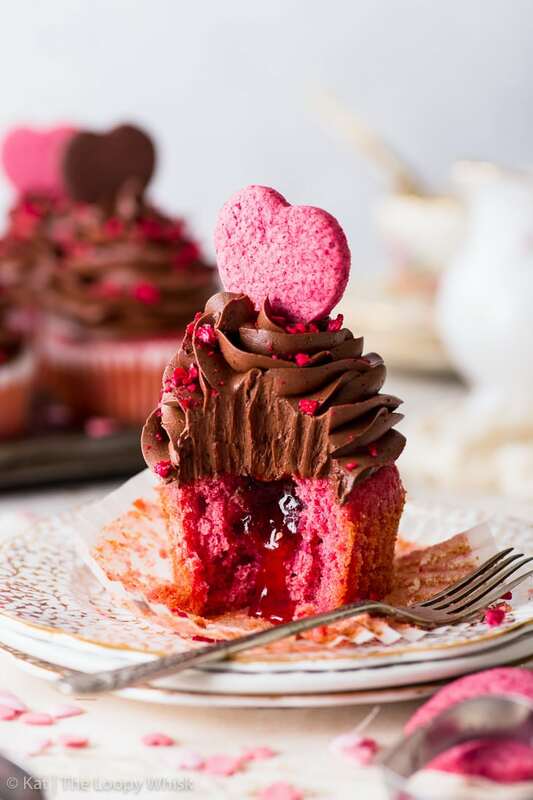 Romantic, delicious and beautiful, these raspberry & chocolate Valentine’s cupcakes are perfect for any time of the year, not just the 14th of February. 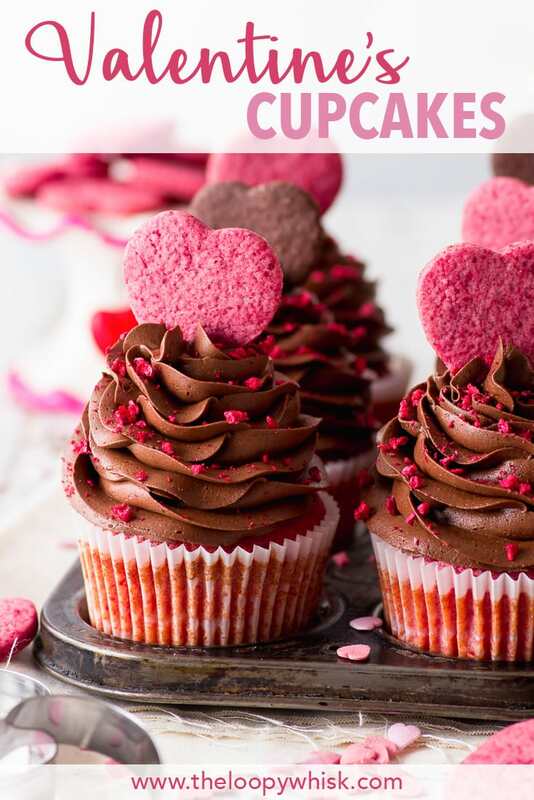 Make them for your loved ones, or even just for yourself – after all, cupcakes sound like the perfect way to show some self-love. Return the raspberry juice to the saucepan and cook further until it has decreased in volume to about 5 - 6 tbsp. 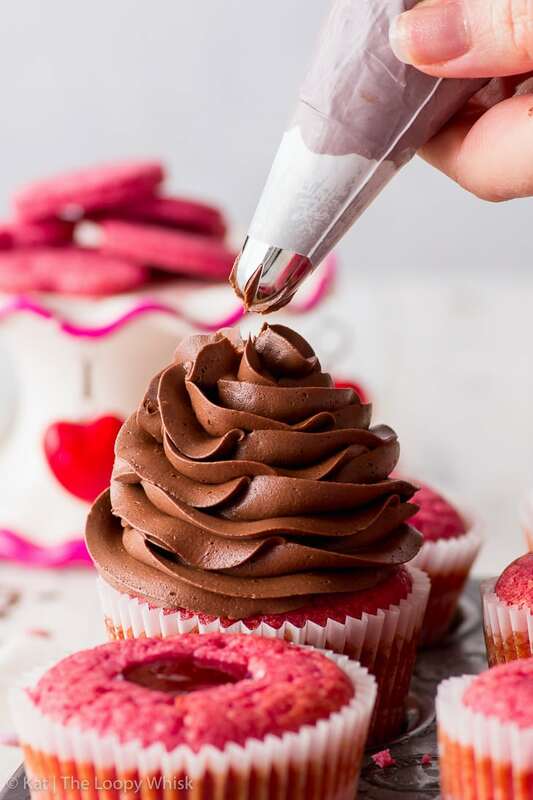 Pre-heat the oven to 355 ºF (180 ºC) and line the cupcake baking tin with cupcake liners. In a small bowl, mix together the egg whites, yogurt or sour cream, milk, raspberry reduction and vanilla paste. Set aside. Sift together the gluten free flour blend, xanthan gum, baking powder and beetroot powder. Add in the sugar and salt, and mix well. 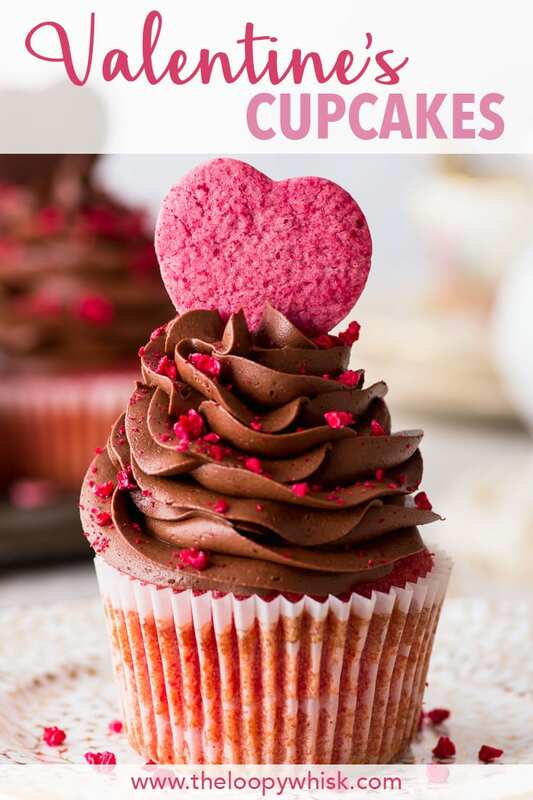 Evenly distribute the cupcake batter among the cupcake cases – they should be each about 3/4 filled. Bake in the pre-heated oven at 355 ºF (180 ºC) for about 20 - 22 minutes or until an inserted toothpick comes out clean. 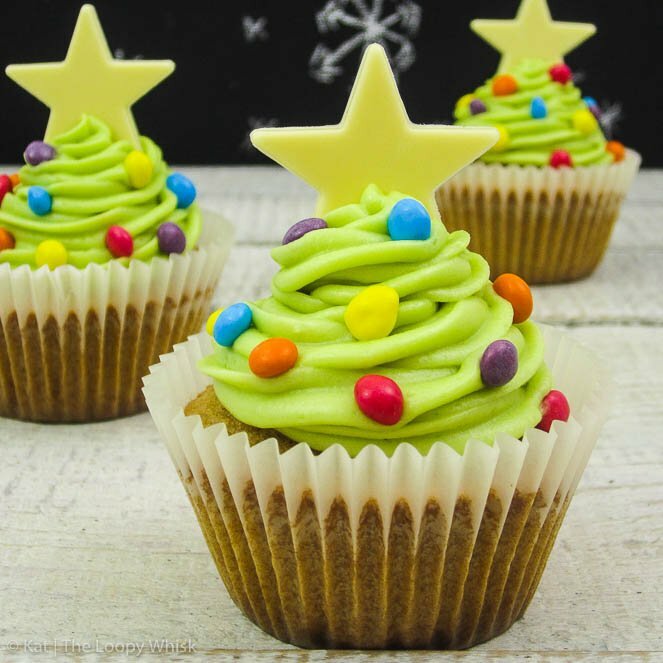 Use an apple corer or a piping nozzle, turned upside-down, to create a hole in the middle of each cupcake. Fill it with the raspberry jam. Sprinkle with crushed freeze-dried raspberries, and top with heart-shaped pink cookies or other decorations of choice. 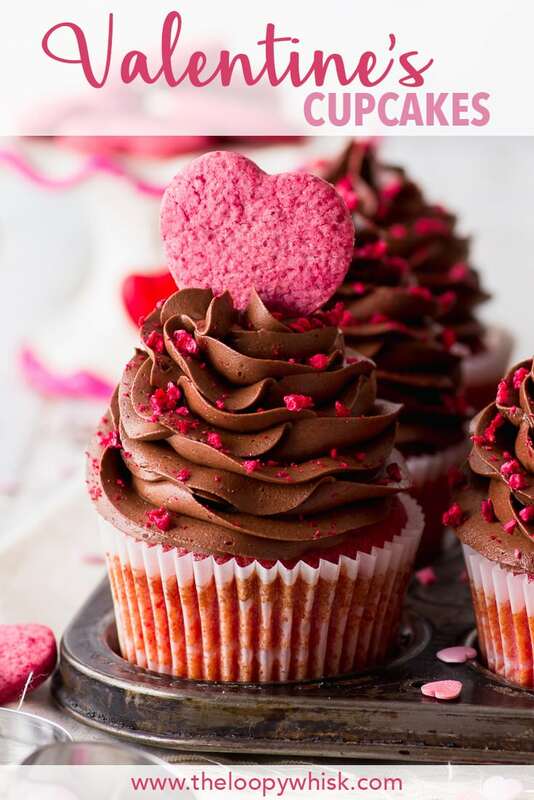 The raspberry & chocolate Valentine's cupcakes keep well in a closed container in a cool dry place for about 2 - 3 days.